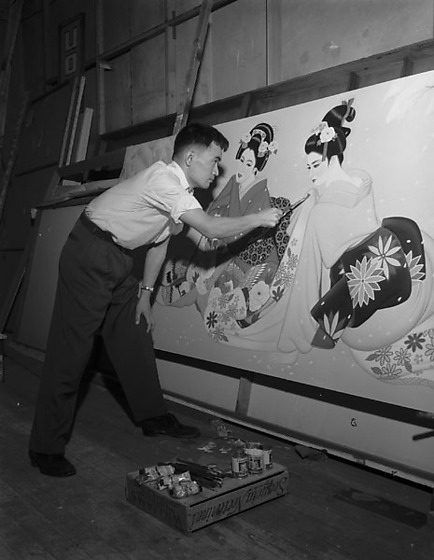 Mr. Izuno, an artist from Japan, paints two women in kimono a large canvas in California, 1958. The long horizontal canvas leans against a wall at right as man in white shirt and dark pants leans forward to paint a raised kimono sleeve. Bottles and tubes of paint and brushes sit on upside down fruit crate, "Sequoia Nectarines." Wooden floor and walls. Typed on original negative envelope: Izuno, Mr. -- Artist from Japan.